We offer Slide down contests at Devlish Dream. With each game you play at Devlish Dream you can conquer a spot on one of the 6 Slide down contests. Each contest covers a buy in range, so that when you play e.g. a game that costs L$10 you play for another contest than a player playing a game that costs L$1000. The Slide down contests pay out automatically although you can also cash out your winnings so far, whenever you feel like. As you see on the picture, this slide down contest is connected to No Devil games with buy ins from L$50 to L$249. 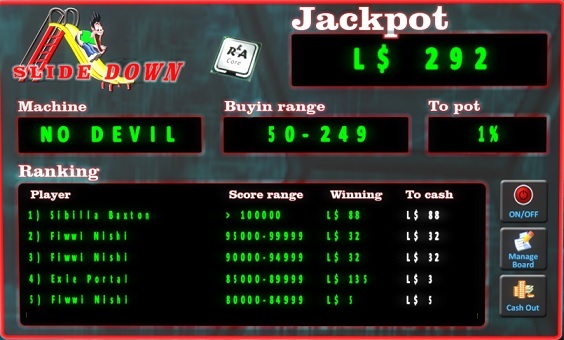 Each time someone plays one of these games 1% of the buy in will be added to the jackpot of the slide down. The total jackpot now is L$292. 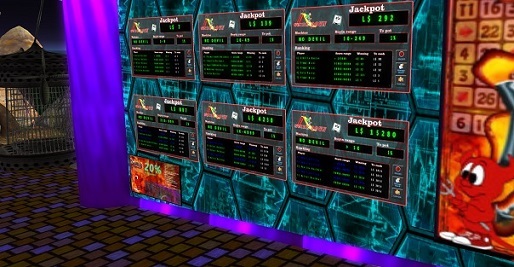 It is of no concern what the current jackpot is, that is the sum of all amounts won by people holding the current slots. It’s just a number. The money added after each played game is divided equally over the 5 slots. Decimal values don’t get lost, they accumulate until it is getting a full L$ and then it will be added. Suppose you play a game connected to this contest and score 86,000 points. 1% of the amount you played will be divided over the 5 spots on the board but you will also conquer a spot on the board yourself. Your score of 86,000 is within the range shown at the 4th place, so you’ll conquer the 4th place. You won’t get the amount shown there, that’s already won by the player now holding the 4th place. Your name will be at the 4th spot, with a winning so far of L$0. The player who holds that spot now, Exie, will drop to the 5th spot. The player who holds the 5th spot will drop off the board. The amounts go with the player, so Exie will take her L$136 with her, and Fiwwi will get paid the L$5 she won. This is why the Slide Down has its name, when your spot gets conquered, you won’t be off the board but only slide down a spot. This until you drop off the board again. Once you conquered a spot, you will earn every time someone plays. This until you drop off the board again. The money you earn is paid to you when you drop off the board. You don’t have to do anything, it will be paid automatically. However, that can take a while. If you want to be paid out sooner, click the cash out button on the board. You will be paid the amount you won so far. The board shows an amount you won and and an amount you can still cash. After being paid, the amount you can still cash will be set to zero. You keep on earning after a cash out. It doesn’t change your position on the board, the only thing that happens is that you get your money a bit sooner. * After you already won a game: Aim for the highest score possible. It is always in your advantage to conquer a spot on the Dropping Score Contest. * Perhaps refain from playing (at the specific price range) when you have all or most spots on a dropping score contest. Earn money while others play, instead of conquering spots that you already have.